Wearing Ambre Eccentrico is like eating Halloween candies, not just some, but a whole bucket full of them, blindfolded. The initial pleasure is great – you get tasty ones like Cinnamon Amberlicious and Tonka Bonka; they are classics and everyone’s favourites. In the mix you also get plasticky Plum Bums and cellophane-wrapped sun-dried fruits disguised as candies. As you crawl to finishing line in a span of 8 hours, you’ve realized that the bucket of candies came from trick-or-treating in a Turkish neighbourhood who didn’t care for Halloween at all. Ambre Eccentrico is named aptly for it is not your typical amber perfume; it is resinous and fruity (not the fresh ones like apple or pear, but sun-dried ones). It reminds me a little bit of Chanel Egosite, which also has a dried fruit note, but Ambre Eccentrico wants to make sure you get the idea that it is an eccentric amber-based perfume, and they amplified the fruit notes. The result is an addictive but also nausea-inducing perfume that you want to wear occasionally with half a spray, and not everyday. The coworker sitting next to me is a 30-something year old man who immigrated from Pakistan to Canada when he was a young teenager. He is a video game level designer, and every afternoon he takes a break and goes to pray at a prayer center unexpectedly located within walking distance from our office above an auto repair shop, and returns to work with a Wendy’s milkshake most of the time. He loves anime and wears a different nerdy T-shirt to work everyday like I wear a different perfume. He is familiar with both the Middle Eastern culture and the Western culture, and has a very liberal heart (I would say he has “synced up” with the Canadians’ worldview), a 100% nice guy, and also a devout Islamic follower. But little does he know, he has a more important purpose in life – a guinea pig for the perfumes that I develop with my perfumers. “Here, smell this.” I don’t know how many times I have handed him a paper napkin, marked with a number and sprayed with some work-in-progress perfumes. “Not bad,” “it’s very nice,” “this smells like a spice cabinet,” “this smells like attar from Pakistan,” “please flush it away, now, immediately” are some of his typical comments. I was deeply worried, for the perfume that I just showed him was almost done, and “it’s not a perfume”. A few days later while looking for a stapler, I found a sample of Armani’s Bois d’Encens in my drawer, and sprayed some on myself. Out of curiosity, I asked him for his opinion on this perfume. The sky suddenly cleared – he needed a new life. No, a new wife. No, not really, but now I know I could release any perfumes that I like without worrying too much what other people think. I have to trust my taste. To be fair, Bois d’Encens is a very straight forward perfume, exactly like what the title suggests, it is just woods and incense, with pink pepper, labdanum and vetiver. But the simplicity demands your attention and respect – it’s a tall, dark, austere smelling scent. When wearing it, you have the right to remain silent and refuse to answer questions. I grew up in a Catholic school environment in Hong Kong and was taught about the Bible since I was a teenager. (Interestingly enough, my school didn’t require students to be Catholic and I have remained a non-religious person.) So naturally I learned about the birth of Jesus and the super exciting part of receiving gifts of myrrh, frankincense and gold. I had no clue what myrrh and frankincense were even after looking them up in a English-to-Chinese dictionary. This little unsolved mystery carried with me until I started paying attention to perfume ingredients. Myrrh is the resin of a small tree and is used in perfumes since the beginning, but I never knew what it smelled like, and trying to find out from smelling a perfume is almost as hard as finding what turmeric smells like from smelling curry powder. Then one day I had an idea. 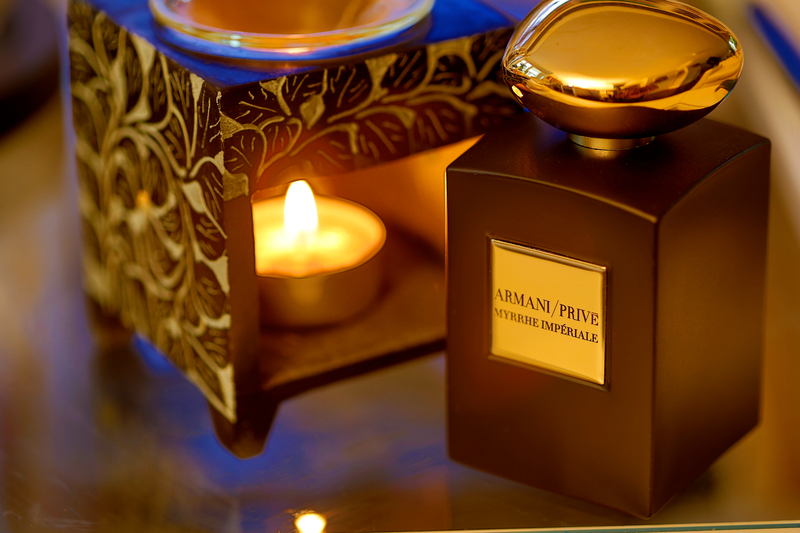 Let’s buy Armani’s Myrrhe Imperiale (2013) and I would know what myrrh smells like! Well, that idea was as dumb as a potato that doesn’t sprout. But let’s talk about the perfume itself first. Myrrhe Imperiale smells good and luxurious, but not amazing or unique to me. It’s warm, moody, smooth and refined because it has the three kings of resin in it: amber, benzoin and myrrh. It also smells mildly sweet and spicy as it has vanilla, saffron and pink pepper. (May be a bit of honey? Not too sure.) But in fact, this resins + pink pepper is the base of many perfumes released in 2010’s, from cliche designer’s scents to expensive perfumes like Amouage. For that, I regretted a little bit buying this perfume, and up to that point I still didn’t know what myrrh smelled like (not their fault).